Oh my god this is incredible!! I saw a load of the animation a few months ago. Thank you! There was a two-part film made in Czechoslovakia in the '50s and in Germany in 1960 (I think). The Czech actor looks almost exactly like the drawings! There were films? I had no idea. Links? Great addition to library in any case. So much love for this book. Read for the first time thirty years ago (FFFFFFUUUUU). Apparently Svejk was originally a serial character, I've added the collection of the original sketches before Hasek began the novel. Hmm.. I swear I've seen a version with Klaus Kinsky. Thought It was directed by Werner Herzog but I can't find any evidence of it on the interwebz. Ah, I recently gave up defeated. It had been sitting round on my bedside table for most of the last year. Only got up to the part where the Chaplain sold him to Lieutenant Lukas, I guess that's about a third of the way through. I feel inadequate now. This is one of the best books ever. The translation is a bit stodgy though. There is however, a new print on demand translation doing the rounds. 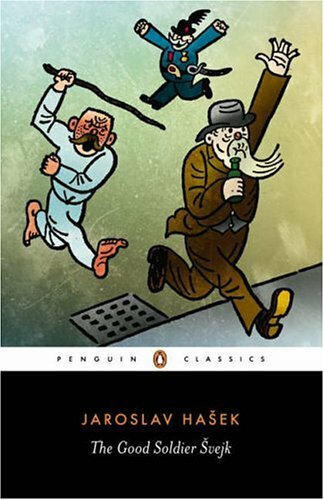 The original Penguin translator did Hašek's The Red Commissar which contains the further adventures of Švejk and other stories. I've also got an Esperanto language collection called Ne nur Soldato Ŝvejk (Not only soldier Ŝvejk), which contains a fair bit of autobiographical stuff. A great book though you have to be in the mood to really enjoy it. ‘The Bad Bohemian – The Life of Jaroslav Hasek’ (Abacus/Sphere 1983), by Sir Cecil Parrott is informative about his life, though rather ‘stuffy’ as indicated by the author’s name! All along the line,' said the volunteer, pulling the blanket over him, 'everything in the army stinks of rottenness. Up till now the wide-eyed masses haven't woken up to it. With goggling eyes they let themselves be made into mincemeat and then when they're struck by a bullet they just whisper, "Mummy!" Heroes don't exist, only cattle for the slaughter and the butchers in the general staffs. But in the end every body will mutiny and there will be a fine shambles. Long live the army! Goodnight! Loved it when I was younger, should give it a re-read.